Sometimes, as druids and as nature-oriented people, we focus only on the fuzzy and happy parts of nature: blooming edible flowers, fuzzy soft rabbits, cute animals, soft mats of green moss, and shy deer. But nature isn’t just about things that are comfortable to us and that bring us joy and peace–nature is also about survival of the fittest, about defenses and predators, about huge storms, floods and destruction. I think its important that we learn about all aspects of nature, even those that don’t always make us comfortable. Part of this is because nature is a reflection of ourselves–we have our dark parts, the parts we wish we could avoid or forget. And understanding these many pieces of nature, I believe, helps us better understand the complex mosaic that makes up any human being. 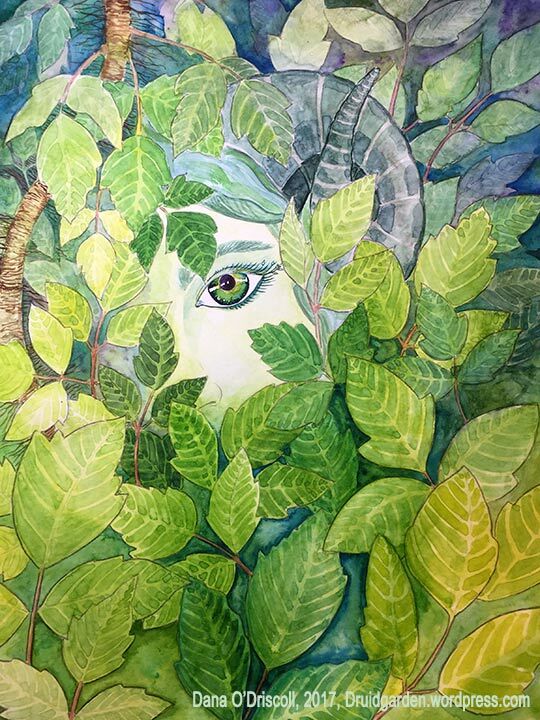 But another part of this has to do with honoring nature–without connecting with the many pieces of nature, we are in danger of misunderstanding her, of not seeing the whole, and not having a whole relationship with her. Each year, I lead somewhere between 6-8 plant walks in my local area and broader region. A lot of the work of a plant walk focuses on shifting perspectives, on reseeing “weeds” or other undesirable plants in a new light. One of the plants that I find myself always teaching about–and learning about–is poison ivy, or, as some affectionate plant people like to call her, “sister ivy.” I have a great deal of respect for Sister Ivy and find her to be a wonderful teacher and plant ally. This doesn’t mean I am going to go roll around in a mat of poison ivy, but I am going to respect and honor her. And so today, I’d like to share some of the teachings of this particular plant ally–for she has much to teach. Spirit of Poison Ivy, from my Plant Spirit Oracle Project. This part of my own work with poison ivy to better understand and work with her. Poison Ivy (Toxicodendron radicans) is a plant native to the Eastern Part of North America. (You’d be surprised with the number of people who think it is “invasive” because in our current ill-suited language about plants, invasive = bad). Poison ivy has multiple forms. First, it can grow as a carpet of smaller plants rising up from the ground (either in a forest setting or even in a field of tall grass). When it grows like this, it is actually a trailing vine, but you might not see the vine as it may be buried in the soil. It can also row into a large bush (which is rare where I live, but not rare in other places) and the bush can be up to three feet high. Finally, it can grow as a vine up a tree (and blend in well with the tree leaves). In this way, poison ivy is extremely adaptable and resilient; she has many forms and disguises, and can blend in well. Given her teachings, this is very appropriate. Leaves of three, let it be. (Of course, there are lots of plants with three leaves that are not poison ivy, like raspberry, but it is still a well known statement). Three leaves and shiny. (Again, lots of plants that fit this description). Hairy vine, no friend of mine. (This, to me is more useful because in my ecosystem hairy vines do equal poison ivy). Berries white, run in fright” or “Berries white, danger in sight” (This is also useful; it can refer to a number of other kinds of plants, but none of them are good – Doll’s Eyes and poison sumac are two others that are very toxic that come to mind). 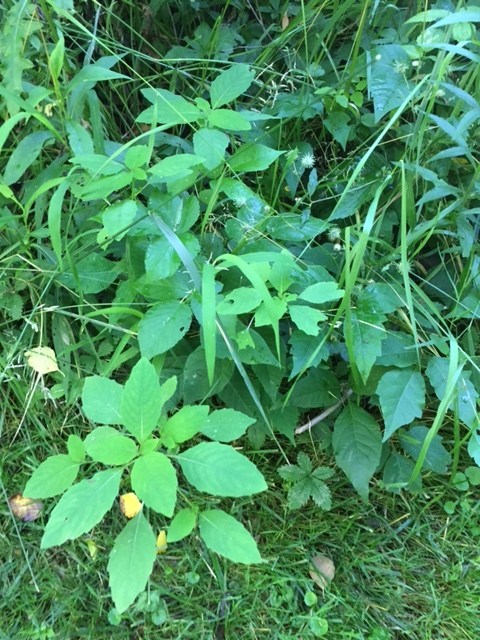 The way that I teach poison ivy identification has to do with the pattern of the leaves (see my drawing to the right). This pattern is very distinct for poison ivy but some leaves display it more readily than others. I created a graphic to help you remember. 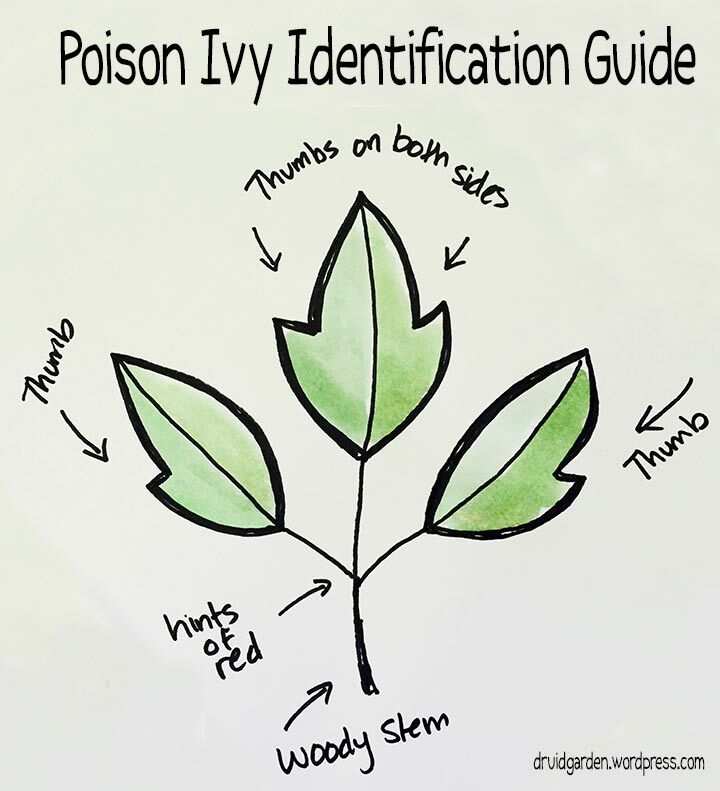 Essentially, most poison ivy has two mittens (with thumbs facing outward) and a central mitten. Some plants may have more than one thumb, but the main thumb is the most distinct. Some may have the barest hint of a thumb, but it is still there. Now, we’ll move to look at what I see as poison ivy’s three main teachings. Ironically, all of them speak to challenges of our present age: awareness, land defense, and climate change. At the end, I’ll also talk a bit about the “poison ivy” contact dermatitis (and how to deal with it!). In reading a book called Finding Your Way Without a Map or Compass by Harold Gatty, he offers a taste of how humans could once “read” the landscape in great detail. In the case of Gatty’s work, re-learning some of how to read the natural landscape helps with navigation and finding one’s way. The challenge is that most humans, at least here in the US, have lost their ability to be keenly aware of their surroundings. We don’t know how to quietly observe or be present, our attention spans are much shorter, and we’ve lost a lot of human wisdom surrounding interacting with the natural world. A lot of time, people pay very little attention to where they are going or what is happening in their ecosystem (and they may have headphones, eyes glued to screens, and so on). Poison ivy doesn’t tolerate such behavior. She asks us to be present with each moment. She asks us to observe, to pay attention, to be aware. If we are aware, we can avoid the more intense lesson she offers: that of the “poison ivy” contact dermatitis we are all so familiar with. 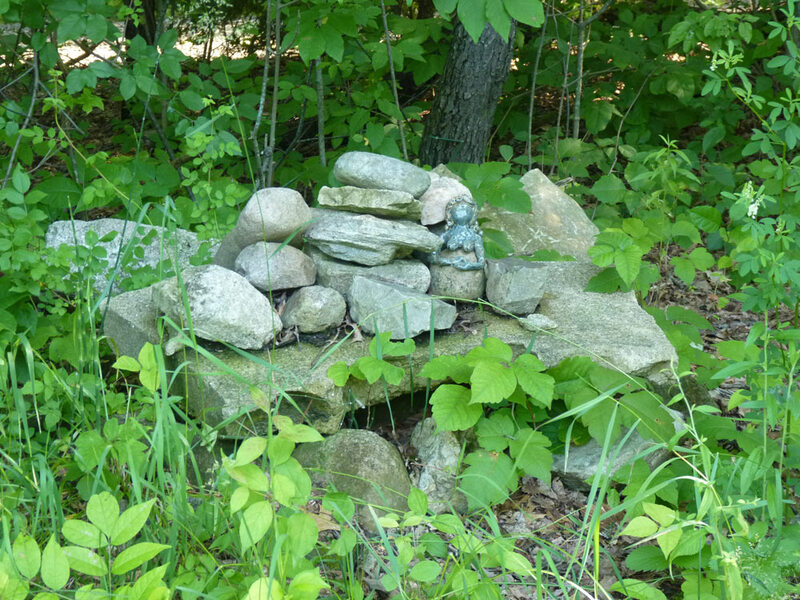 That poison ivy is awareness medicine was a teaching was first given to me years ago by my herbal mentor, Jim McDonald, and it began helping me begin to see poison ivy in a new light. When you start observing and paying attention for Poison Ivy, it changes the way you interact with the world. Because Poison Ivy takes multiple forms, she really demands awareness in a variety of ways. Even as an experienced wild food forager, herbalist, and druid, I sometimes make a mistake and Poison Ivy teaches me a powerful lesson. For example, one year I was harvesting beautiful St. John’s Wort to make into tinctures and infused oils. I was in this tall grass in a field with a friend, happily harvesting away, paying attention only to the St. John’s Wort plants. And then we looked down, and we realized that about a foot lower tucked away in the grass was poison ivy. I slathered myself in fresh jewelweed and did get a bit of the rash, but it wasn’t too bad. Just enough for me to remember to pay attention. Old poison ivy vine – note the many hairs. Poison Ivy’s climbing form is particularly adept at shapeshifting and in enforcing this lesson. Her climbing vine is distinct, but can often blend right into the wood of a tree (or be climbing up the opposite side of the tree and you don’t see it). Her leaves, then, literally blend into the leaves of whatever tree she is climbing. This means you need to not only keep an eye on the ground, but also an eye above you. I’ve had numerous occasions where I failed to look up and had a poison ivy branch brush my face. Fall brings yet another lesson from her climbing form. 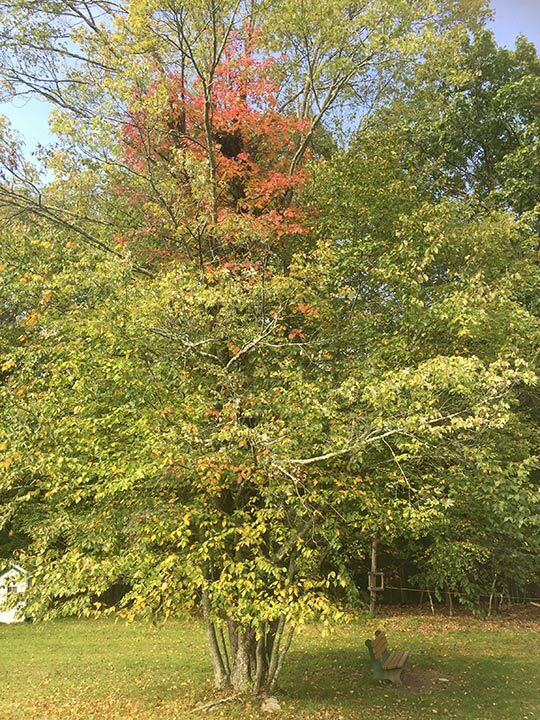 These higher branches have leaves that turn a beautiful red, and then, as leaves are apt to do, drop. So if you are walking around barefoot, or even deciding to rake leaves and jump in them, you can be in for a surprise a day or two later. Knowing where these vines grow, then, is part of the knowledge of the natural landscape that poison ivy teaches. Sister ivy demands that we pay attention to our surroundings, that we be more alert and more aware. This is awareness medicine, and it is a powerful and potent lesson for each of us in an age of distractions. Discussion of poison ivy as awareness medicine directly ties to her second powerful lesson: that of defense. Poison ivy defends the land, particularly delicate ecosystems, and keeps humans out. Poison ivy is much more dominant in North America today than it used to be for a number of reasons. One of these is that she is an edge plant that takes advantage of disruption. Humans have caused such rampant ecological destruction and environmental disruption that poison ivy has grown much more dominant in the ecosystem. I see the rampant growth along the edges of wild spaces as a defensive act on the part of the land herself. If you look at where and how poison ivy grows, you’ll start to see a pattern: edge spaces, tree lines, along suburban homes, along the edges of the old forests that still stand. Poison ivy sends a strong “Keep out” message to all who are willing to see and pay attention. You might think of this like a “No Trespassing” sign. I remember this lesson well when I was visiting Kelly’s Island in Lake Erie a few years ago. Every forest on that island was surrounded with a 30′ mat of poison ivy. Like its own kind of “unwelcome” mat. I, and my companions, honored this forest’s request and stayed out. I’ve also seen this a lot with ancient trees–there is often a poison ivy vine growing up them–nobody is going to want to cut it down. I’ve also witnessed this many times all along the edges of suburbia. Where the chemical-drenched lawns end, there is poison ivy as the first line of defense for the forest. Sister ivy is the defender of the wild spaces. Not only is there a lot more poison ivy present in the world today due to disruption, researchers have found that poision ivy is gaining in power as Carbon Dioxide levels globally rise. More CO2 makes poison ivy vines more abundant; increasing their growth and biomass–they have doubled their growth rate over the last 50 years. Further, as CO2 levels climb in our world, so too do the levels of Urushiol, the toxin within poison ivy’s sap that irritates human skin. According to a follow-up study, with the rise in atmospheric carbon, not only does urushiol increase, but poison ivy’s chemical balance changes, meaning that its potency has doubled since 1960 and will continue to increase with more atmospheric carbon. In other words, the more that the human race dumps CO2 into the atmosphere, the more of a warrior poison ivy becomes. Sister Ivy offers this a direct message from the earth to stop, find a new path, and live once again in harmony with nature. The vines and leaves of poison ivy contain increasing amounts of Urushiol, which, when touched by the skin, causes the allergic reaction (contact dermatitis) to affected skin. Urushiol is found in the clear liquid sap of the Poison Ivy plant; many animals can eat the leaves or interact with the plant without trouble, but it certainly affects humans. Some people are more susceptible to the urushiol than others; further, the more exposure one has, the more intense the skin reaction can be. 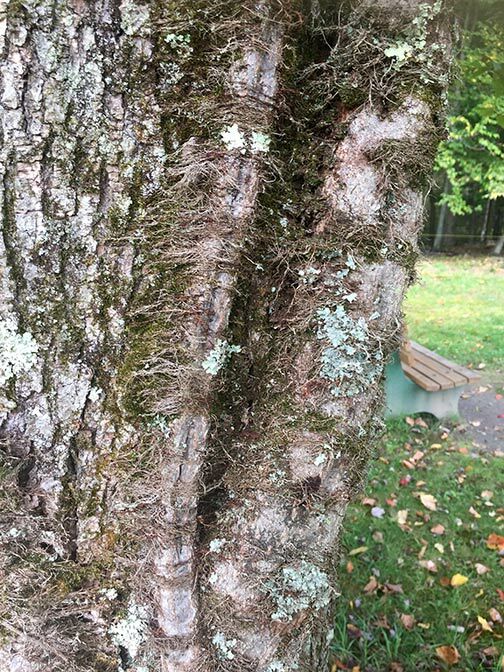 This is why some people think they are immune–they might just not have had a lot of contact, and one day, they’ll get poison ivy dermatitis all over them (as an herbalist, I’ve heard quite a few stories of this happening!) There are also people who appear to be totally immune to the dermatitis. A simple witch hazel infusion of jewelweed is a wonderful remedy to the poison ivy rash (and I described how to make it earlier this year). Because Urushiol is oil-based, it is imperative when treating poison ivy rash to treat it with something that does not spread the oils further (like scratching does). The witch hazel infused with jewelweed is great because it dries out the rash (witch hazel) and promotes healing (jewelweed). Let’s just say with all of my adventuring in the woods each year, I end up getting poison ivy fairly regularly and this always does the trick. Applying it 4-6 times a day should clear up poison ivy within a few days and prevent it from spreading. I see Sister Ivy as an incredibly important teacher for the 21st century. She reminds us that we need to pay attention to the world around us, that we need to be present her and now in the moment. She reminds us that nature is all pretty flowers and fuzzy bunnies: nature is wild, powerful, and she seeks to defend herself. Poison ivy is a part of nature that is responding aggressively to the damage we are causing this earth. She is a warrior, and, like any warrior, can be a dangerous foe or fierce protector. I like to encourage you to build a respectful relationships with this plant. If you respect her, she will respect you, and you may learn a great many things. In a burn pile smouldering away (this also happens a lot where I live). Some of the more radical folk, like permies and guerrilla gardeners the like, might end up composting their leaves in our gardens or otherwise keeping the nutrients on our properties; but this is a rather rare approach and one not practiced by the bulk of the American populace. Many of us who are radical gardeners go out seeking the bags of leaves left on the curb to bring additional nutrients to our properties (I do this every year). However, not all of us have the benefit of composting or keeping our leaves–not raking, mulching, or composting leaves is illegal in some township or city mandates and also in many subdivisions throughout the US. And leaves aren’t often the only things found in the leaf compost bags–usually when I go out to collect, I find a good deal of other matter and live plants. This year, at about 10% of the houses where I picked up leaves, I also found the remains of someone’s backyard garden (tomatoes) and at another 10% I found other kinds of food from trees just thrown away (walnuts, apples, acorns, pears, etc). And so, today, I’d like to explore this practice a bit and its long-term impacts on soil health…and what we might do instead. Leaves from the side of the road for my garden! When people talk about the leaves that drop from the trees in the fall, they often call it “leaf litter” or “yard waste.” Looking at the brown paper bags that people buy to store their leaves in for pickup, they say “Lawn refuse” or “Yard Waste” or “Refuse” on the sides. We label the bags and then frame what we put in them as waste or refuse; something to be discarded. So we are already creating a framework for seeing materials that come from our yards as “waste” rather than seeing the nutrients in the leaves as a valuable thing. 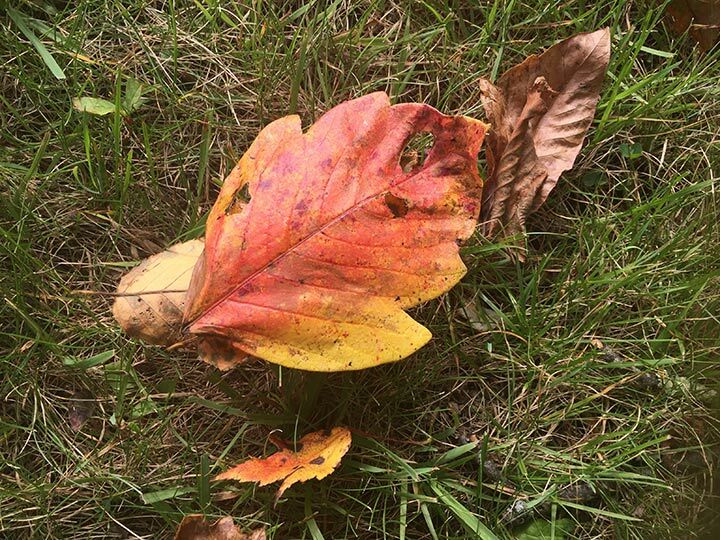 The other issue I’ve been pondering for some time is the nutritional content of the leaves, and how many nutrients leave a typical American lawn in suburbia each year when they are discarded. I found a reasonable analysis about the nutrient content leaves here; their calculations are based on one ton of leaves (which, granted, is a lot of leaves). This section presents a look at the nutrient content in leaves and how much is lost when we put them on the curb (or how much is gained by picking up someone else’s leaves). Before I get into my analysis of how much we lose by putting leaves on the corner, I have a few caveats. First, this kind of analysis requires quite a bit of assumptions and estimations; I’ve done my best, but what I have found might be specific to my local area in South-East Michigan. Second, I’m certain that leaf nutrition varies pretty widely based on the soil profile of the region, the nutrients present or absent in the soil already, the types of trees, the weather for the year, and so on. With that said, I do think even a rudimentary analysis, like the one I’m presenting, gives us some starting points. Methods: On my trips out to get leaf bags from the side of the road this year, I did some counting in my area to estimate the amounts and weights typical bags of leaves had. I went out for three weeks and brought back 46 bags of leaves; I went out twice each week to different areas within a 3 mile radius of where I lived. I counted how many leaves people left on the curb and when I got back, I weighed them to get their average weight. In a fourth week it rained, and while I collected bags, I did not weigh them because the water weight would have impacted my findings. I then did some simple math using the numbers above. 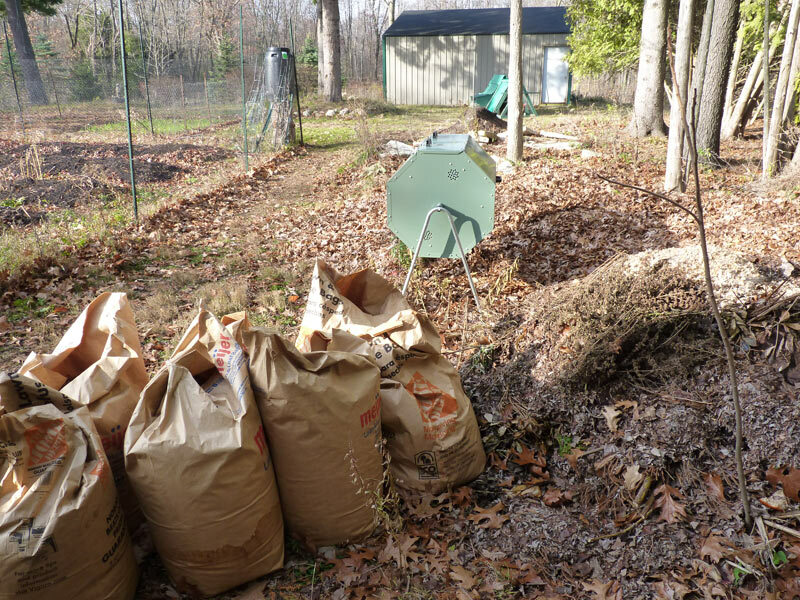 Amount of leaves per bag and per yard: Most leaf bags I picked up ranged from 8lbs – 22lbs, depending on whether or not they were shredded. Shredded leaf bags typically account for about 20% of the bags I pick up. Even unshredded bags are often compacted and pretty heavy, especially if the leaves fell relatively flat or were slightly wet when they went in the bag. The average for the bags was just above 10 lbs. People in the suburban area where I go leaf hunting put out an average of 4.5 bags of leaves on collection day; some had many more, and most had been putting them out for a period of weeks. My estimate is that most families in my area put out at least 7 bags of leaves in a fall season assuming they have a few trees in their yard dropping leaves; this amounts to about 98 lbs of leaves (I’m going to round this to 100 lbs to make the math simple). And Iron, Zinc, and much, more. That’s a lot of nutrients. And that’s just the leaves–I don’t have any way of figuring out what whole tomato plants and other plants ripped up from the soil are also contributing, but I suspect these numbers are much higher. And then, if homeowners are also removing their grass clippings all season long, that’s a whole other calculation to include. These numbers are striking, but what is even more striking is the fact that I haven’t accounted for any other kinds of “yard waste” such as grass clippings (put out on the curb weekly or bi-monthly by many) or other kinds of yard compost that people don’t want. I might do a case study of this at some point, but for now, we can see the potential for soil nutrient health decline. I’d like to offer one other piece of evidence as well. My house was built in 1945, so my yard likely suffered the same fate for most of the last 70 years as well. When I got at my homestead a few years ago, prior to putting in the garden, I ran soil tests. These are exactly where the leaves (and lawn clippings) would have been taken from (and I knew from taking to my neighbors that the people who owned this house did such practices). I found that the soil where I wanted to put in my garden was pretty much sand. It had little organic matter and a P.H. of 8.2 (our PH is high in this area, but the lack of organic matter made it higher). It had only 8 PPM of Phosphorus (considered extremely low), 22 parts per million of potassium (low) and magnesium of only 27 parts per million (extremely low). To get my soil prepared for growing crops…what did I do? Went around and picked up everyone’s leaves, imported massive amounts of organic matter in the form of manure, compost, and this year, even a pile of seaweed from a local pond. And now my soil tests are beautiful and my soil is rich and healthy (and much lower in PH thanks to the organic matter all of the leaves helped create). What’s going back into the soil? Not enough. In a natural process, assuming no removal of nutrients, it takes 500 years or more to produce one inch of topsoil. This gives you a sense, I think, of the enormity of the challenges that face us in regenerating landscapes with these destructive lawn practices. But, you say, aren’t people putting things back into the soil? Yes, and we’ll take a look at that next. 1) Plants can pull certain kinds of nutrients from the air; typically this is nitrogen and oxygen. So certainly, some nitrogen theoretically could be being brought back into the soil, although typical lawn ornamentals and grass don’t do this well. 2) Most nutrients are in the soil, and those nutrients are cycled through the dropping and decay of organic matter. Trees and other plants (like Burdock, Comfrey, Dandelion), penetrate deep into the ground and pulling up nutrients to the surface, which they then deposit as leaves or dead plant matter. But how many nutrients are down there for the taking? If nutrients are systematically removed from the same spot over a 25, 50, or 100 year period, I suspect that at some point, the ground underneath will simply run out of those nutrients. I also have a theory (untested) that this is part of why we have so many plant and tree diseases. We keep removing organic matter and nutrients from our landscapes in this form, through logging, etc, and those aren’t going back into our system. 3) People also often add fertilizers; but most commercial fertilizers focus only on the three macronutrients: nitrogen, phosphorus, and potassium. All of the micronutrients (some of which are critical to plant and human health, such as magnesium or calcium) are not added. Fertilizers also come in a water soluble form (nitrate) and cause substantial problems for our waterways (I am not going to spend the time today to describe soil ecology, but a good introduction to it is here). 4) Mulch is sometimes also added to select areas. 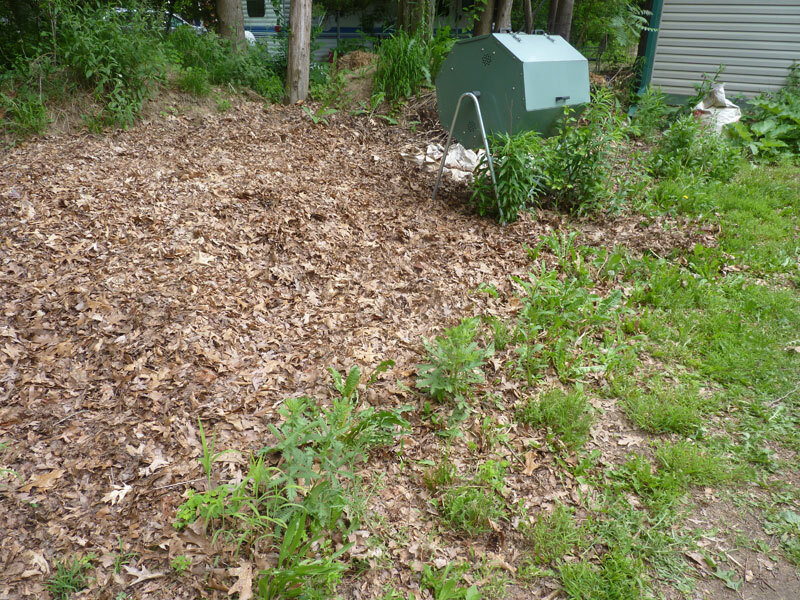 But wood mulches are very high in carbon and little else. 5) Some people do buy compost and add it in select areas (say, a garden) but this is in select areas; I don’t see people dumping compost all over their lawns to make up for the loss of nutrients. More on this in my next post. So even with the inputs, it seems likely that a substantial net loss in nutrients in the soil immediately surrounding most of our homes and communities due to the “composting” practices of leaves and grass clippings. 1) More and more people are becoming interested in urban gardening, homesteading, and the like, and yet, if they want to dig up their backyard, they are facing soils with literally no nutrients, organic matter, or life in them (as I faced when I started my homestead). If we all wanted to do this, where would all the nutrients come from? 2) We aren’t looking at a few places of depletion, but probably we are facing it with nearly every suburban and urban home in the US. When we combine this with modern industrial farming practices that kill soil life and strip the soil bare, its a very worrying issue. 3) The systematic loss of particular kinds of nutrients is also concerning; in my herbalism course, we have spent a great deal of time talking about magnesium deficiency (which the bulk of Americans are suffering from) and deficiency in other micro-nutrients; interestingly, many of these showed up in the list of what was in fall leaves and being removed. Even if you were to grow some veggies in your soil that you added some organic matter to, would there be enough magnesium and other essential nutrients for your own body’s needs? 4) Perhaps most worrying of all: if history has anything to teach us, the widespread degradation and depletion of soil and other resources leads to a civilization’s collapse. Combining this with many other ecological challenges suggests the widespread and systematic need for radical change. I’ll elaborate on these concerns and what we might begin to do about this in my next blog post, which will discuss the concept of restoration agriculture and further discuss permaculture design.